Barbara Bush with AU Public Health Scholar, Shiko Wambaa. 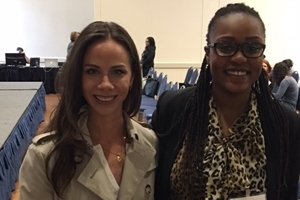 AU Public Health Scholar Shiko Wambaa and Public Health Scholars Program Director Melissa Hawkins attended the 2016 Global Health Mini-University at George Washington University. Held on March 4, the Global Health Mini-University is an annual day-long learning forum for global health professionals and students. Barbara Bush, co-founder and CEO of Global Health Corps (GHC), spoke to a packed room of attendees for the Discover Your Global Health Career panel session. GHC is a leadership development organization focused on mobilizing a global community of young leaders to improve health equity by pairing young professionals under the age of 30 with a nonprofit health organization or government agency in a year-long paid fellowship. “This was my first time attending the Mini-University. As I approach my last year at AU, I am eager to learn about the job and fellowship options that are available to me after graduation, as well as new skills I can practice and develop as I consider applying for different opportunities,” said Wambaa, a second year Public Health Scholar who is interested in global health. “The career panel was informative and inspiring. I am excited as I prepare for the next steps in my public health career!"